Jamie Oliver has a new cookbook out called Great Britain; 130 of his favorite British recipes, new and old. TLC Book Tours asked if I’d like to review it. Darn tootin’, I wanted to. This isn’t just any ‘ol cookbook. This is a COOK. BOOK. 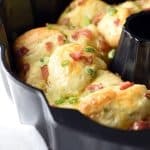 Loaded with pictures for every single recipe (love that! ), and shots of people and landscapes. Stories, blurbs, and quotes fill the pages. It’s a cookbook you actually read, letting every page envelope you. If there’s one criticism, the layout of the recipes are inconsistent, some formatted horizontally, while others are vertical. And the directions tend to be in one run-on fashion, making it more challenging to separate the steps. But in all fairness, this book could also be filed under art, and those aspects play into that. After looking through the pages, is it any surprise that I chose a dessert to try first? Paleeze. Right when I saw coconut, I knew. I also have my eye on the scones, poached pears, and honey comb. And there’s plenty of savory dishes I’ve earmarked – his Smoked Haddock with Poached Egg (poached. egg. hello. ), Spinach on Toast (sigh), Asparagus with Poached Egg and Smoked Salmon (there’s that egg again! ), Creamed Mushroom Soup (pass me a spoon), and the Sunday Roast Steak (yes, please.) Dare I even mention the Crackled Pork Belly? Ah lawdy. 1 lucky U.S. or Canadian reader has a chance to win a copy of Jamie Oliver’s Great Britain. THIS DRAWING IS NOW CLOSED. The lucky winners were Jason and Teresa. Preheat oven to 350 degrees. Thoroughly coat an 8×12 inch cake pan with non-stick cooking spray. Cream the butter and sugar together until lovely, pale, and fluffy. Then beat in the eggs, one at a time. Gently fold in the flour and baking powder, add a splash of milk and the vanilla. Mix again, but do not overmix. 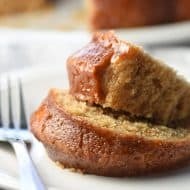 Pour into the cake pan and cook for 25 minutes or until a toothpick comes out almost clean. Let cool completely. If your preserves are extremely dense and not easily spreadable, place them in a small microwave-safe bowl and cook for 10 or so seconds to loosen the up a tad. 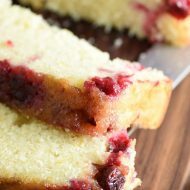 Once cake is cooled, turn it out onto a board, spread the jam all over with a palette knife or thin, flat spatula. Sprinkle the coconut over the top and serve with tea, custard, or all by itself! *NOTE: Jamie, being the professional chef that he is, made his own blackberry jam with 9 ounces blackberries, 2/3 cup sugar, and juice from 1/2 a lemon. Mashing it together in a small pot and simmering it down for 20 minutes, then letting it cool. I just bought raspberry preserves in a jar for ease. I’ve been in love w/JO since I first saw him on TV years, and years ago. I have always appreciated his approach to food; simple and delicious. And I’d love to have his newest cookbook too! This looks delicious. I would love a copy of this cookbook! OMG, I love him too… from the very moment he hit the TV I could not watch enough of him. To date, I have two of his cookbooks and would be thrilled to own the newest one! I love his approach to food, it’s simple, it makes sense and it’s delicious to boot! I can’t wait to try this cake! Um, jam and coconut with cake? Sign me up. I’m glad you’re enjoying Jamie’s latest book! Thanks for being a part of the tour. You can’t have too many cookbooks…especially those from adorable chefs! Love Jamie Oliver! The cake looks delish. This recipe looks yummy! And the book looks great! I enjoy cooking Jamie Oliver’s recipes this sounds like a nice book. Thanks for the chance. 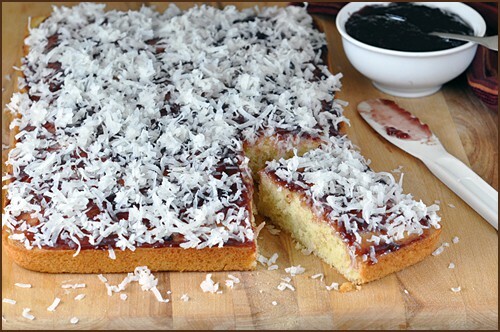 That cake looks great-I love the simplicity of spreadign preserves on top and sprinkling with coconut. It reminds me of something…I’ve seen small squares of cake spread all over with jam and then sprinkle dwith coconut but I don’t know what it is called. Nevermind, I just looked it up on a friends blog-this reminds me of Lamingtons, an Australian dessert except they coat in chocolate usually and then coconut. But my friend used jam for hers that’s why this reminded me of this. Run on comment much? Anyway, it looks great! Love Jaime! I love coconut with anything! OK, I’m making it RIGHT NOW! 35 minutes till cake time? Sounds delightful! I love Jamie Oliver’s recipes. They’re simple and full of quality ingredients. 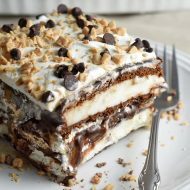 This dessert looks great! Jam and coconut are a great combo! Delicious! 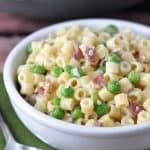 Saw your photo on FoodGawker! Left a comment on your Facebook wall. Oh my goodness. That looks so divine! Thanks for the opportunity to enter. Delicious!!!! Definitely I’ll try it! Saved. Thanks for sharing. I adore Jamie Oliver! This recipe sounds like a winner — and I’d love to try out more from the book. Definitely adding it to my must have list! He really shook things up with the schools in Los Angeles. They fought him all the way, but now I hear the food is getting healthier. I love to watch him make pasta. He also does a demonstration where he can make a meal faster than fast food. Just a treasure. I love Jamie Oliver! And Sadly, Don’t own Any of his Cookbooks . . . Looking forward to trying this out later today. This cake looks lovely, so I’m going to make it later today. this cake looks spongey and perfect – and coconut – and Jaime! All awesome! Found you on FG! That cake looks amazing….and having lived in the UK going to have to get my hands on this book! Can’t wait to hear about the other recipes you test out. Sigh. I love that man. Especially after his Food Revolution. All of his recipes are written like that though…I think it’s his style. leaving a comment on FB and your lovely site. I not only Like…you on FB…but I love you on FB !!!! oh how I love Jamie Oliver and oh how I would love to own one of his books !!!! Love Jamie Oliver! Hope I win the cookbook! This is an easy, light but rich recipe. So this one gets added to my pile of “to make in the future” cakes! That cake looks yummy! I can’t wait to try it. I love Jamie Oliver and would love to win this giveaway! Always loved his shows and food, but he gained my respect more with his Food Revolution initiative in schools. Would love another one of his cookbooks! He’s so cool, kind of Cooking’s bad boy-love to have his new cookbook!! I love, love, love Jamie Oliver. Did you know that he’s so popular that they print his cookbooks in Norwegian?! This recipe sounds great! And yes, please put my name in for the cookbook! I need something new to drool on. Sound like a great way to spend some Saturday afternoons. what an awesome giveaway – i love jamie oliver. thanks! Wow! Gotta have this cookbook! Not only is Jamie Oliver yummy, but you mentioned poached egg and pork belly- hallelujah! I had that book in my hand saying….coconut or leeks…hmmmm. Now we all get to enjoy! Looks wonderful! Amy~You know how I am with coconut!!!! Love Jamie Oliver!!! I need another cookbook like I need a hole in my head, but there is always room for Jamie!!! What a fun giveaway and I love that it’s loaded with pictures. I’ll always choose a picture loaded book over one without any at all.